Apps that work on location finders are not a novelty, however this one is. GottaGo, a new Android app, detects your location and helps you find a restroom where you can answer nature’s call. In alien places, or even in known ones, it gets difficult at times of emergency to hunt for a loo. GottaGo does just that and comes to your rescue! It takes care of finding you a public washroom, where you can relieve yourself. it just takes you to open the app and it will identify a number of options of public washrooms close to you, so you could use the best option! Since the app works on location services, it not only spots the restrooms near you, but also guides your way along. The distance, both in terms of space and time flash on your screen. The places are depicted with different symbols as to whether it is a restaurant’s public washroom, or one at the railway station. Different colours used underneath the symbols can help one distinguish it quicker. Here are some features that make the app interesting! 1000’s of toilets listed and geo-located, with address and direction guide. Malls, Hospitals, Hotels, Restaurants, Railway Stations, Museums all mapped. Ranking by users and the expert team. The app founders say that this idea was born out of quest for clean restrooms while you’re out in the open, maybe holidaying, or even shopping, or out on distant work meetings. At places unknown, to hunt down a place, or to even judge a place from the outer looks of it can be a task due to lack of clean public utility spaces in our country. “We started a website that listed information of restrooms, area-wise on a website called p911.in back in 2010. With the smartphone medium, the experience got better with detecting the location of the user using GPS and then directing the user through navigation that they are already familiar with”, says Kunal Sheth, the tech entrepreneur behind the idea of GottaGo. He was happy with the feedback he received when he did a trial run amongst friends and family. Young mothers were happy to find clean restrooms, which were hygienic to stop by at. “With the growing risk of infectious diseases such as urinary tract infection or other infections, we wanted to only list the cleanest options available. We had a few evangelists in every city go and check out these places before we listed them. We also built user feedback into the app, which allows users to rate the options provided once they use the facility. They can also let us know if a restroom isn’t working any more or is shutdown”, Kunal added. 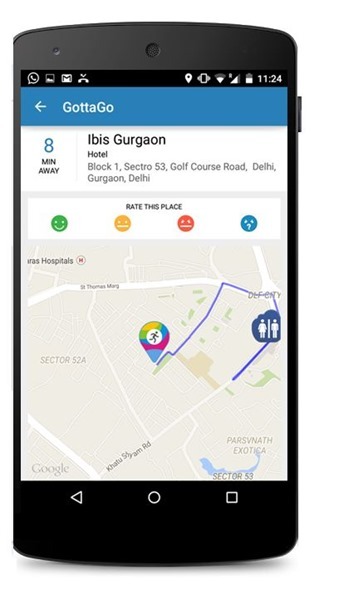 The app, which has mapped 10,000 restrooms across Mumbai, Pune, Delhi NCR, Bangalore, Chennai is currently available on the Google Play Store and will soon be available on the Apple App Store. So next time you are traveling outdoors, make sure you have this app on your smartphone – You never know when you will need it!